Table-1: BACKGROUND. Current Concept of Space Elevator. This table reviews how a very long cable can provide vehicle transport from the Earth's surface into space or orbit, without large rockets. Table-2: Related Concepts. 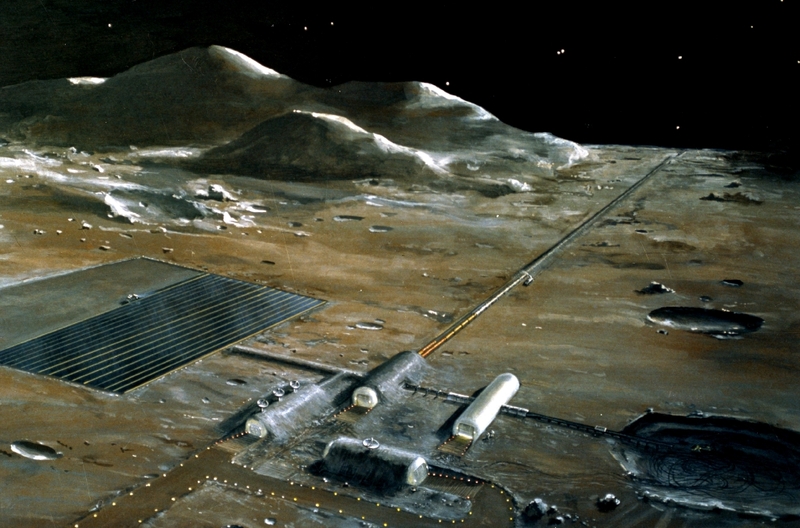 There are many other proposals for "non-Rocket" transport into space. This chapter describes a few. This concept proposes vehicle transport from the Earth's surface into space or orbit, without large rockets. A counterweight at the end of the space elevator will keep the ribbon taut (much like a tetherball stretching a rope from a pole). Geosynchronous Equatorial Orbit (GEO) is an orbit where objects circle the globe in exactly one day. Thus, a GEO object can stay "parked" directly over any point of Earth's Equator. 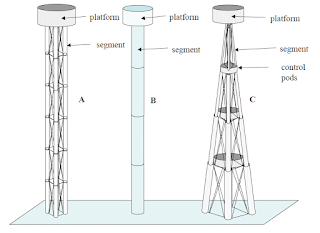 Platform at 0G would process climber contents. Cables would connect to the platform at both top (spaceward) and bottom (Earthward). Habitat at 1G provides very comfortable living quarters for over 1,000 climber passengers. Like other habitats throughout the Solar System, it would simulate Earth gravity via spin induced centrifugal force and obtain power from solar light reflected via attached mirrors. Blocks of sea ice would likely be a common climber payload; as need for water will be great. 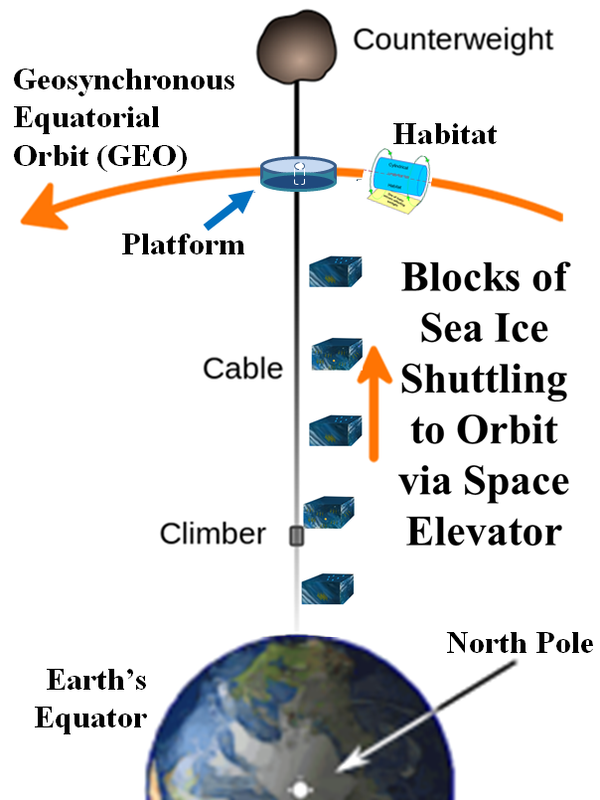 Space elevator's cable would anchor to an offshore sea platform (not shown) on Earth's equator. for "non-Rocket" transport into space. A few examples are described below. 1) Space Tower theoretically extends to the edge of space (the 100 km Kármán line). 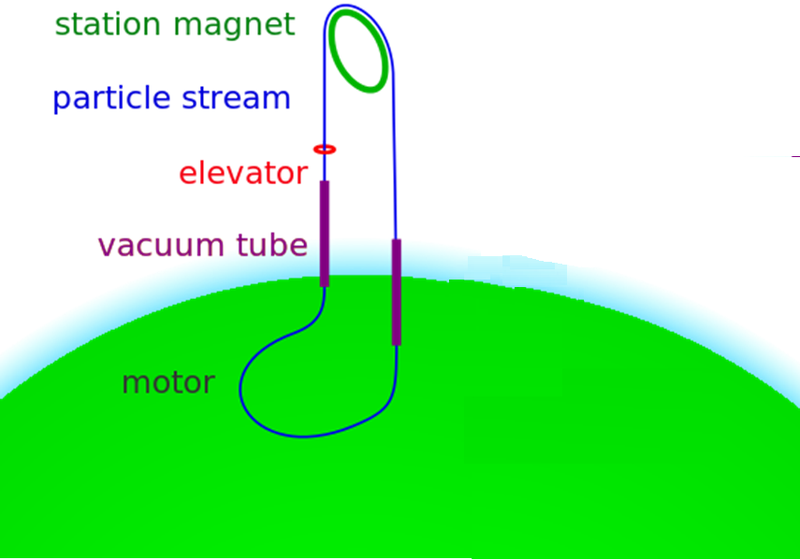 If the tower could extend completely to GEO; then, transported objects could drift away with minimal power and would stay in a circular orbit. Inspired by the Eiffel Tower, Konstantin Tsiolkovsky was first to consider a compression, "tower" like, structure as a means to orbit. • support pillar for the distal part of a mass driver. • "gun barrel" of a space gun. 2) Pneumatic Space Tower. An inflatable free standing tower would move equipment and tourists from Earth’s surface to 20 km above. 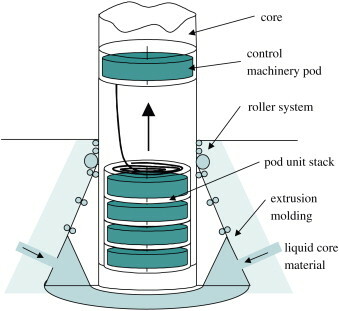 Construction would require a series of Kevlar-polyethylene composite tubes inflated with hydrogen. Per New Scientist, a 15 km tower (atop a 5 km mountain) would have 100 modules and would weigh 800,000 metric tons when fully pressurized. Scientists designed a freestanding 15 km tower of kevlar tubular columns inflated with a low density gas mix; dynamic stabilization system uses gyroscopes and "pressure balancing” to withstand many simultaneous wind shears throughout the tower’s vertical span. • functional access to the entire range of altitudes within structure’s reach. Major Disadvantage: Buckling. A long slender construction is bound to have considerable integrity issues. 3) Space Fountain accesses geostationary orbit without tensile strength. Instead, space fountain cycles fast-moving pellets from the bottom of the tower up to the top; then, it redirects them back down to the bottom. The overall effect of this redirection force holds the tower top aloft. Payloads either couple with this stream of pellets or climb up the side of the tower. • It can use materials with normal strength. • Location: It can operate at any point on the Earth’s surface. • It can go lower than geostationary orbit. • It has an extremely-high-energy active structure. • It needs constant power due to energy inefficiencies. 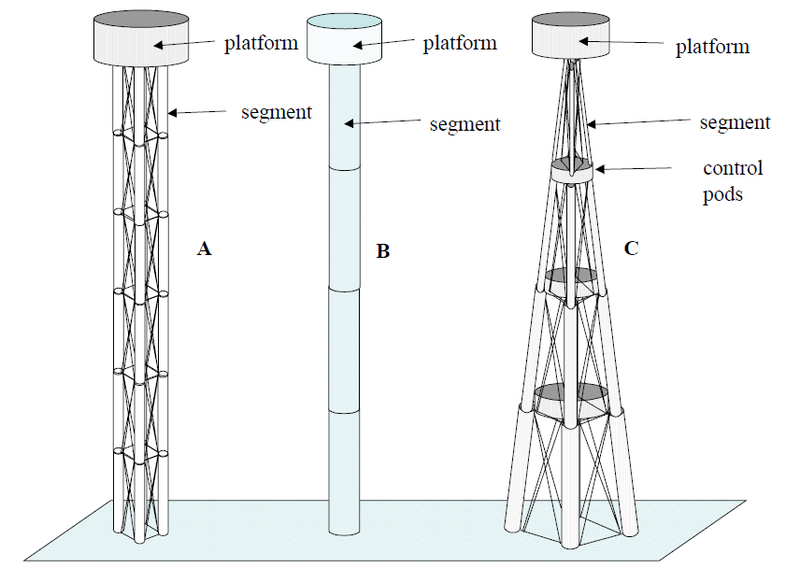 • Tower could collapse if particle containment systems fail. coil gun which wraps around the projectile in the form of a long tube. 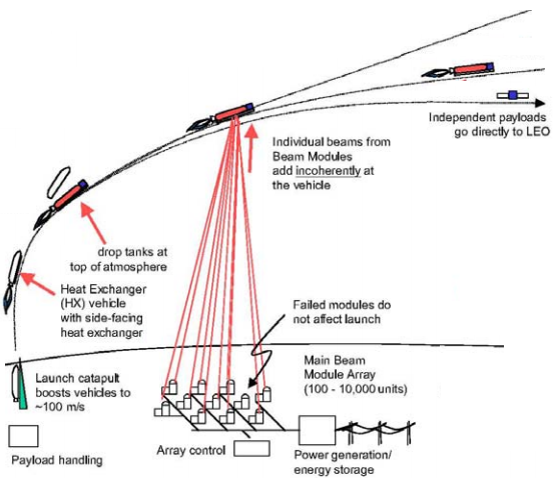 5) Laser Propulsion System (LPS) uses remote laser farm to propel vehicles out of the atmosphere. While in the lower atmosphere, the high energy, laser beams super-heat ambient air inside the vehicle. Super-heated air molecules act as reaction mass to propel the vehicle. Reaction mass is a group of many, tiny super-heated air molecules which exit the vehicle at a very high velocity; the very large space vehicle reacts to this momentum by slightly increasing its velocity. Over a few minutes, the cumulative effect of these momentum exchanges accelerates the vehicle to orbital velocity. Once out of the atmosphere, inertia should carry the vehicle into orbit. Thus, a LPS uses external lasers to provide the launch energy and ambient air as the reaction mass. REQUIREMENT: LPS requires a launch system to get the object to an initial velocity of 100 m/s for the LPS to effectively engage. LLL can likely launch vehicles as large as 5 metric tons by electromagnetic acceleration into Earth orbit. Travel above route in reverse. The loop is actually a 4,000+ km long tube, i.e., “sheath”. Floating inside the sheath is continuous iron rotor, which resembles a very long cable. approximately 5 cm (2 inches) in diameter. moving at 14 kilometers per second. For more about LLL, see High Stage One. 1) The first private manned spaceship, SpaceShipOne, achieved orbit via combination of several technologies. It reduces rocket performance requirements with an air launch component; it also uses a hybrid rocket motor which uses both liquid and solid fuel. 2) One could combine a rail gun with ramjet technology. An electromagnetic rail gun could initially accelerate a space vehicle to 300 m/s to launch into the lower atmosphere. Ramjet engines could then engage to further accelerate vehicle up to orbital velocity. 3) The Millennial Project combines a mass driver for initial lofting followed with additive thrust from a carefully sequenced, series of ground-based lasers. Further details are in Marshall Savage’s book. SpaceShipOnelaunches from a small aircraft. After launch, it uses a hybrid rocket with two different propellants in two different phases. - one solid and the other either gas or liquid. This avoids some disadvantages of solid rockets such as difficult fuel handling, while it also avoids some disadvantages of liquid rockets like mechanical complexity.